Balochistan is not Bangladesh, but its worth trying !!! Suddenly Balochistan is in news. Credit goes to Shri Narendra Modi, the Indian PM. Most of the people in India never knew about Balochistan. Coming directly to the subject. 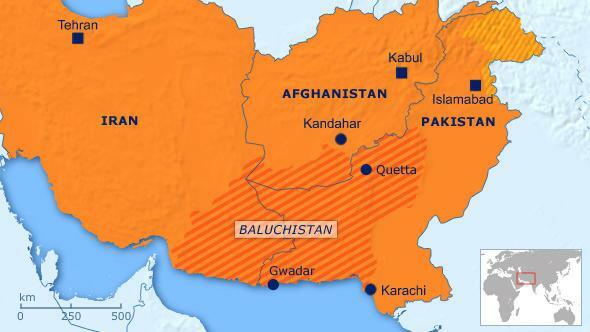 Many of the people are getting an impression that India can easily separate Balochistan from Pakistan, as they did with Bangladesh (East Pakistan) in 1971. This perception is wrong because of the below key differences between Bangladesh & Balochistan. India doesn't share any physical boundary with Balochistan as they did with Bangladesh. Ability for logistical support will be bare minimum. Pakistan mainland has a direct boundary with Balochistan which was not the case with Bangladesh. In case of Bangladesh, Sheik Mujib-ur-Rehman was a single united political force which could rally the masses of Bangladesh after him. No clear vision on what could be a future Balochistan as a Nation. How the natural resources will be used? Will it be an Islamic republic? Iran Factor: Iran will not support idea of Baloch nationalism as it may impact the Baloch population in Iran. They may want to join the new Balochistan Nation. In case of Bangladesh, there was no such case with any other neighbor. Based on above points, its very clear that India can't play a role in case of Balochistan as it did in case of Bangladesh. It has to use only covert means. Give a voice to Balochistan Cause & build an opinion among various countries. India can provide a voice to Balochistan cause in various international forums. Help define the dream of Balochistan as a single nation with a way forward. Baloch nationalism may directly impact the territorial integrity of Afghanistan as well as Iran. Both being friends of India, India should build an understanding that the new Balochistan state will only in Pakistan part and they won't start a new struggle to unite the whole Baloch population once they are independent. Convince China that Free Balochistan will favor it with availability of resources and no impact will take place for existing projects. Connection of Gwadar & Chabahar port, once Balochistan is free state. For any insurgency to sustain for long they need arms training as well as money to feed themselves. Waziristan operations : Pakistan is busy conducting Zarb-e-azb operations in this part. Ethnic tensions in different parts of pakistan will keep them busy internally. Like MQM's dictat in Karachi. Get Kashmir issue kind of resolved with converting of LOC to actual border. China will want Gilgit-Baltistan to be settled as CPEC passes through it. Make Pakistan give more rights to Baloch people and some more autonomy. India can convince Balochs with autonomy and make compromise on separation. In-road access to Pakistan & India among themselves. Is Modi Neutralising China's "String Of Pearls" ? Since the new BJP-led government has come, we have been witnessing a lot of foreign trips by our new Prime Minister Sri Narendra Modi. Is there something more than economics behind these visits? Well, if we look at these visits and the geopolitical change taking place around the globe, it looks there is possibility of a major military adventure which can't be denied. The "String of Pearls" set by China in the Indian Oceans to contain Indian within the ghetto's of South Asia. The "String of Pearls" include Gwadar (Pakistan), Hambantota (Sri Lanka), Chittagong (Bangladesh), Sittwe (Myanmar), which are in close proximity to India. Every one understands that its to secure China's energy supply lines as its dependent on petroleum imports heavily similar to India. But same ports can be used against Indian interests in case of any eventualities. Burma :- Myanmar government now has much better relation with India as compared to china. There has been some unease between the relationship of Burma & China post Kokang incident. Relationship with India on the other hand has improved following the military operations near the Nagaland-Burma border. Indian security personnels like Ajit Doval and others are visiting Burma to improve relations. It has been a known fact that Indian Military & Burmese military relationships are good & cordial and they don't have any conflict. Many times when burmese crossed the border following burmese rebels Indian Military looked as if nothing happened and same thing is being done by Burmese military now. I believe there are some talks of Indian government helping Myanmar fight the insurgents of Kachin. Myanmar on its side is trying not to be more than dependent on china and is trying to build closer relationship with India & ASEAN countries. India is financing construction of Sittwe port in Myanmar to access its land locked north east. Bangladesh (Chittagong):- Narendra Modi visited Bangladesh to move the Indo-Bangla relationships to the next level. The main highlight of the visit was actual closure of Land Boundary Agreement with exchange of enclaves, which has been due for long. Bangladesh will be able to use Indian territory to access markets in Nepal & Bhutan, 2 Billion $ of credit to Bangladesh, two new bus services to connect kolkata & north eastern states, and many others. Teesta didn't took much attention as all attention was grabbed by LBA agreement. The one with the highest strategic implication was allowing Indian Cargos to use Chittagong (One of the pearls). It means Indians cargo will enter the port and at the same time have some information on the chinese movements their. Now Bangladesh & India share much more greater trust and hence chances of Bangladesh allowing China to use its naval or land resources for anti-India activity is low. Sri Lanka:- Sri Lanka & India always had some hiccups in their relationship in the past because of LTTE. Former Sri Lankan president Rajapaksa was much closer to chinese than to Indians. But with the change of power, new president Sirisena is moving the balance of power back to India. China Communication Construction Company (CCCC) which was responsible in development of Sri Lanka's colombo port city is involved in corruption charges. Hambantota has not proved to be economically viable yet with loan and interest amount to be paid to China, even after being declared a free port. Well one can concede that even the new Government in Sri Lanka can't offend the chinese as they are in need of investments and can't repay the loans already taken. However, new Sri Lankan government has given some hints that it may not allow any submarines to doc in its port ,in future, to calm down Indians. India so far has focused its investments in the north of Sri Lanka (Erstwhile - Tamil Eelam). But with the Chinese economy showing signs of going down and Indian economy picking up the present situation can be turned around in near future. Pakistan's Gwadar & Iran's Chabar: Well this is open knowledge of everyone that India can't do anything about Pakistan to stop anti-India activities. So the Indian response has been to develop Chabar port in Iran. 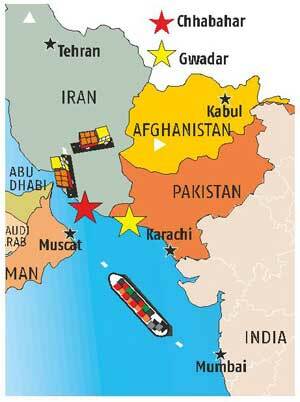 However interesting both the ports are located in the provinces having some Baloch resentments. With western sanctions expected to end very soon, India needs to get Chabar port developed fast and make it operational for bigger ships, while working in sync with Iran government. Development of this port will provide India with the better access to landlocked Afghanistan and Central Asia countries. So a great game is being played here between India & China. Well the above were some of the ports as part of China's "String of Pearls" around India. And the counter balances which India is taking to nullify the encirclement. Hopefully, under Modi's leadership India will emerge as a super power and not be enclosed in ghettos of South Asia.